3 years & up. Little engineers will have hours of fun learning STEM skills and strengthening fine motor development with these four uniquely different products. Each has its own appeal for early engineers, including creativity and endless design and construction. 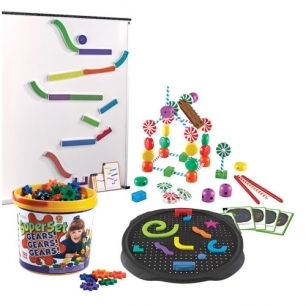 Set includes Tumble Trax, Candy Construction, Create-A-Maze, and Gears! Gears! Gears!® Comes with activity sheet. Magnetic whiteboard not included.